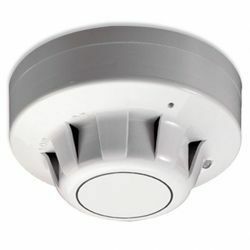 The Apollo 55000-217APO is an Ionisation Smoke Detector from the Series 65 range of conventional fire alarm system detectors. This detector uses the ionisation type sensing method to detect smoke particles in the atmosphere. This detector is part of the Apollo Series 65 range which also includes an optical smoke detector, fixed temperature heat sensors, rate of rise heat sensors and high heat sensors. There are also a selection of bases available including a unique sounder base with an integral base for the detector. This sounder base is unique to the Apollo range of equipment. In additional to the Apollo 55000-217APO detector we can also supply the ranges of Apollo XP95 and Discovery analogue addressable devices which are designed for use on larger more complicated systems. If you’re interested in this device you may also be interested in the Apollo 55000-317APO and Apollo 55000-600APO detectors.